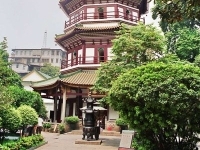 A must-see attraction in Guangzhou is the impressive Temple of the Six Banyan Trees. This ancient Buddhist temple was built around the year 537, during the Liang Dynasty, and still attracts many local and foreign visitors. The three Buddha statues in the temple are famous, but one of the temple's best features is the magnificent statue of Kuan Yin. Kuan Yin is the Buddhist bodhisattva associated with compassion and mercy. Interestingly, perhaps due to the temple's proximity to foreign consulates, it has become traditional for foreign families adopting Chinese children to come to this statue and receive a blessing for their new families. The nearby six-story pagoda is a beloved landmark, and the view from the top is spectacular. It is called the Flower Pagoda because of its distinctive petal-like layers, and is used to store a rich collection of cultural treasures. The temple is surrounded by some lovely gardens which add to the impression of it being a centre of serenity in a bustling city. The temple still feels very authentic and quiet and it doesn't have a gift shop, but souvenirs, like replicas of the pagoda, can be bought at nearby shops.